The Italian slalomists have prepared in Val di Fassa the highlight of the season, the appointment with the World Championships in Åre, Sweden. Manfred Mölgg, Stefano Gross, Giuliano Razzoli, Chiara Costazza and Irene Curtoni trained on the Aloch track in Pozza di Fassa. The Italian slalomists have prepared in Val di Fassa the highlight of the season, the appointment with the World Championships in Åre, Sweden. Manfred Mölgg, Stefano Gross, Giuliano Razzoli, Chiara Costazza and Irene Curtoni trained on the Aloch track in Pozza di Fassa, the same one that, from February 18 to 27, will host the technical competitions of the Junior World Ski Championships Val di Fassa 2019. 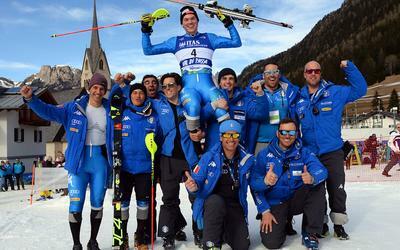 A slope prepared ad hoc for the Italian team, which has had its official training centre in the Trentino area since 2006. Together with the five participants, all the ladies of the national team C was also present, as well as the first line national athletes, among which also Elena Curtoni. The Italian patrol will be led by the veteran Manfred Mölgg, who has already won two World Championship titled in slalom (silver in 2007 in Are and bronze in 2011 in Garmisch) and one in giant slalom (bronze in Schladming in 2013). "I have trained in giant slalom, parallel and slalom, with optimal conditions - explained Manfred Mölgg - coming to Pozza di Fassa is like returning home. This winter I had some problems, but now I'm fine. Would you know if I think about winning a medal? Going to a World Cup without thinking about winning a medal would be a completely wrong attitude. We know we are not the best, but there are two competitions and anything can happen. The important thing is to be able to perform well in both competitions. After Schladming I tried a new pair of skis and I immediately felt better. Now we need the right attitude. There is also great hope in Stefano Gross, who lives in Pozza di Fassa and who, after recovering from his knee injury, cannot wait to give his best. "It iw always nice to train on my home track, which is well prepared - explained Gross - the season has been conditioned by the knee injury and in the last month I have worked only to fully recover: I have done therapies and competitions, without being able to train properly. In the last two weeks I have seen some good improvements, I have found my smile again, and now I am ready to give everything in the World Championship slalom, where only the first three places count. I already finished fourth at the Olympics and I do not want another "wooden medal". Junior World Ski Championships? I am at home and I am sure I will come and see the new levers of skiing up close". In the current season, also Giuliano Razzoli is back in the highest part of the rankings. 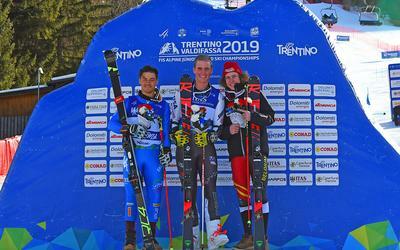 "Here in Pozza di Fassa we found a nice track, perfectly prepared snow, which allowed us to do a great job - explained the Italian - After so many injuries, it is nice to be able to return among the best, but I still have a step to take. The path to full recovery has been long and demanding, now I am going to the World Championship to do my best. This year I was able to express myself in all conditions: the slalom will be held on a fairly easy track. The snow will make the difference". 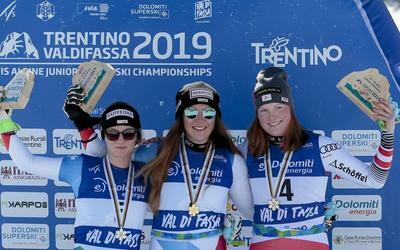 In winter 2018/2019 Chiara Costazza, from Val di Fassa as well as Stefano Gross, was three times in the top 10 in the World Cup season (ninth place in Courchevel and Zagreb, eighth place in Maribor on February 2), meaning she also returned to excellent levels. "We trained well with ideal conditions, and we are ready to leave for Sweden - commented Costazza - I still need something to make the final leap in quality. The best ones are difficult to reach, but it is not impossible. I have worked on the details and the goal is to have the same fluency in the race that I have in training. Technically I feel better and I think I have harvested less than I am worth. I do not miss the experience and I know the world championship track. It is easy, but with hard and aggressive snow it can become more difficult. I hope to be among the best. Irene Curtoni also trained in Val di Fassa, and in the last months she had to deal with back problems. "I was uncertain about taking part in the World Championship, but in the last few days I have had positive feelings and I have come back to believe in it. The feelings go a bit up and down, but when I open the gate I try to give everything I have. In Maribor I competed after a month without training, to prove to myself that I could do it, but at the World Cup we also need to be fast.